Two hours from Paris, near to the beaches of Deauville, Cabourg and Villers-sur-Mer, the Normandy Garden village club is located in the heart of the Pays d'Auge, on a beautiful hilly area of 12 hectares, and its houses and apartments adopt a typical Norman architecture. - The Garden Club district, consisting of VIP single-storey houses with terraces and extends behind the center of the village gathering the reception, the bar, the restaurant, the mini-market and the pool areas. - The Pommeraie district is close to the village entrance. It consists of VIP duplex houses with cladding in their facades and wooden terraces. - The Hameau district, newly renovated, offers apartments with balconies or loggia and unobstructed views of Normandy wooded countryside. - The districts of the Côte Fleurie and Cote de Nacre, Pays d'Auge, Bessin and Bocage offer adjoining houses with garden and terrace overlooking the Normandy wooded countryside (except Bocage which has large balconies). There is a mini-market on site, and a specialty restaurant overlooking the pool. The pool area consists of a covered pool and an outdoor heated pool and the village club is also equipped with a sauna and a hammam. A village club in Normandy, near Deauville, Honfleur and Cabourg. Indoor and heated pool area, tennis courts and covered playgrounds. Clubs for children and teenagers aged between 3 and 17 years old. Make this a holiday to remember! 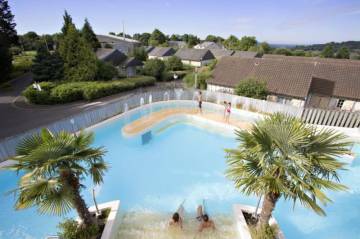 Normandy Garden holiday resort is packed daytime and evening activities and entertainment. With both, free and paid-for options, these are ideal for the whole family. - The Aquagarden is an indoor waterpark with heated outdoor lagoon. - Kids' and teens' clubs from 3 to 17 years old. - Tennis lessons for children and adults. - Fitness classes with Les Mills™ open to all. - Horse riding courses in the horse 'kingdom'. - Sports tournaments to measure yourself against the competition. Set in the Calvados area, 13km from Cabourg, the Normandy Garden holiday resort combines the two faces of Normandy : the green woods of the Auge country and the seaside resorts of the Cote Fleurie (Flower coast) with its endless beaches. - Villers-sur-Mer, and its historic monument, Saint Martin church, are located 10km away from the holiday village. - 30mn away by car, is located Honfleur port, ancient privateer city with its picturesque image, and its equatorial zoological garden, the Naturospace, which regroups many tropical species of birds, butterflies, and plants. - The beaches of Deauville and its famous Planches, constitute an essential walk and are 16km away.